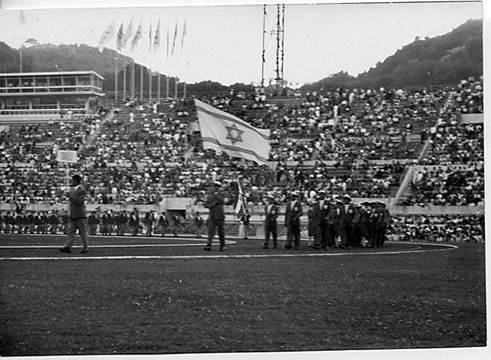 Imagine how my heart pounded in my throat as I carried the Israeli flag high on the Olympic Track that momentous day in Rome in 1960. The Israeli delegates walked in their dark suits behind me as we proudly represented a country that had not even existed when I was born. 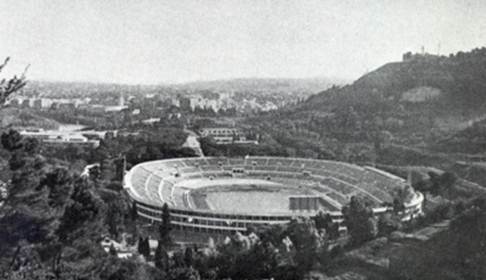 Rome was hosting the games 54 years later than originally planned. Because of the 1904 eruption of Mount Vesuvius, those Roman Olympic Games had been cancelled. 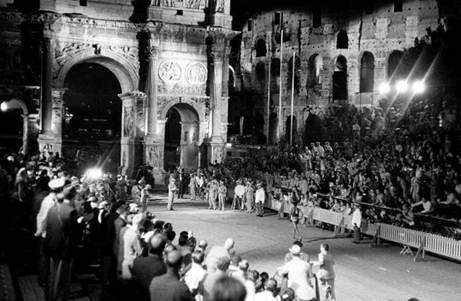 Now, in 1960, the Italians were able to capitalize on more of their history by holding the wrestling competition in the Basilica of Maxentius and the gymnastics in the Caracalla Baths. I could not believe I was marching among men and women who had individually excelled in their chosen sport. Even more awe inspiring to me was that many of these athletes had been my childhood heroes. To carry the flag for my country, to stand in the oval of the stadium shoulder to shoulder with all of these marvelous athletes, was so unbelievable that I had to pinch myself to determine whether this was the most marvelous dream I had ever dreamt or was actually really happening! It was only six years since I had asked Yariv Oren, my coach, if I could ever participate in the Olympic Games and now here I was. I was physically and mentally prepared, although, naturally, incredibly nervous. Perhaps the humanistic teachings at Hadassim had yet again affected my mind. Everywhere I looked there were flags of different countries, here a Russian flag, there an East German, and so on for country after country. It seemed that this carrying of flags was a bit like war. Although I was honored at having been chosen to carry my country’s flag, the nationalism reflected in this blatant separation of countries into competing units was inconsistent with the ideals of the Olympics. 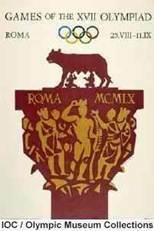 The Olympic Games, to my mind, should not be about nationalism, but mirror the original Greek philosophy which focused on athletic strength and skill. In fact, the ancient Greeks had set aside all wars and conflicts for the duration of the Games. None the less, I love my country and considered carrying the flag and being an athletic representative as an honor and I am happy that I was able to enjoy this opportunity. The achievement, effort, and years of work were part of the preliminary Olympic experience. Being introduced to the World in the Opening Ceremony was a fantastic event. However, we Israelis were shocked and unprepared by the vast quantities of food available to all of the athletic competitors in the athletes’ cafeteria. In the athletes’ cafeteria, there were long tables with huge mountains of food representing types and flavors from every part of world. It was an Olympic Game of food and preparation! At Hadassim and in most of Israel, at that time, we had never had very much food. There had been food rationing during most of my childhood. Here, in Rome, any competitors could eat anything and everything. Shockingly, it was also possible to have second and third helpings. All of the Israeli athletes were Olympian in how we filled our plates! In the long run, it may have been delicious, but was probably detrimental to our collective performances. Within the Games themselves, there were many auspicious performances. 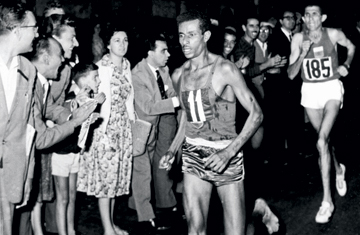 The Ethiopian runner, Abebe Bikila, did not go unnoticed as he participated in the marathon. In his country when he trained, there were no running shoes. The World may have been shocked at this amazing feat, but for Abebe Bikila, it was more normal to run without shoes that with them. He was undaunted by the many condescending remarks and boorish behavior, however, and left all his opponents behind. He victorious crossed the finishing line under Constantine’s triumphal arch in his bare feet. In winning the marathon, Abebe Bikila also became the first black African Olympic champion. 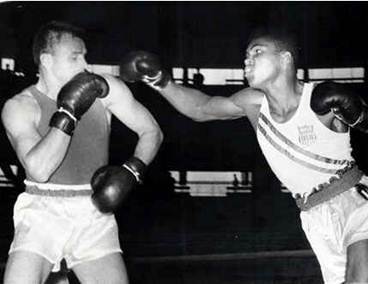 Another competitor was Cassius Marcellus Clay of the US. He won the light-heavyweight boxing gold medal. It was only a few years before he would become a household name as Mohammad Ali. At the Games, we were allowed to train every day at the Training stadium which was open to all competitors. Many observers came to watch the athletes and that was where I to was able to meet, face to face, some of my heroes. I met the World Record holder in the Shot put, Perry O’Brien, and the World Record holder in the Discus throw, Al Oerter, both from the US and both long term residents of my school walls! Al Oerter had already won two Gold medals at the Helsinki Games in 1952 and the Melbourne Games in 1956. It was amazing to train with them but embarrassing to see how much better they were than I was. Oerter was throwing the discus about 200 feet while my practice throws were only at a distance of 170 feet. My best throw, at that time, was the 181 feet Israeli Record which I had set previously. I had no illusions that I would actually win a Gold Medal in the Olympics. I had dreamed of being there and participating in this thrilling athletic adventure. The ultimate achievement for an Israeli discus thrower and Shot putter was to be part of Olympics. However, one day while I was training, one of the coaches who had been allowed into the stadium introduced himself to me as John Walker. He asked me what my plans were for the future. I told him how much I wanted to study in the US but that I needed to complete the mandatory three year Israeli Army service first. He nodded and said that if I was still interested after the army and had made progress in my throws, I should contact him. He told me he was the head coach for Track and Field at the University of Wyoming, the highest University in America! (7200 feet altitude). I had never heard of Wyoming but I immediately assured him that I would love to compete for his University. Deep down in my heart I feared that this would be a missed opportunity since who knew what would happen in 3 years? Before the Opening Ceremony which was the official beginning of the Games, all the teams who participated in the Olympics were invited to the Vatican to meet the Pope, a rather curious meeting for the Israeli team. There were athletes representing about 15 countries the day we were scheduled to visit the ancient Cathedral and to meet Pope John XXIII in his red robe. After the ceremony, the head of the Israeli delegation lectured me about this inappropriate and unacceptable behavior. I told him again that when in Rome, I wanted to be like everyone else. We could give respect to the Pope without betraying our own sacred Jewish beliefs. He agreed with my argument and the case was closed. Finally, it was my turn to compete in the discus event. I was extremely nervous, despite having received a papal blessing! I may have broken records in Israel, but the strain of the fierce rivalry in Rome, the newness of everything, the vast amounts of food, the pressure which I felt from my childhood, and the hopes of my entire country were enormous burdens. The pressure was more than I could cope with and, unfortunately, I had one of my worst performances. Upon my return to Israel, I received vigorous and relentless criticism in the newspapers and from my coaches about my abysmal performances in the Games. However, in the next competition in Israel, I broke the Discus record again and, once more, received favorably headlines. In Israel, military service is mandatory for all men and women at eighteen years of age. 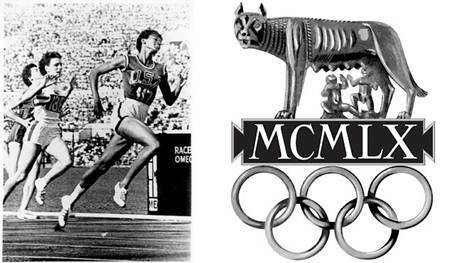 On my eighteen birthday, I had been given a deferment to attend Wingate College and to compete in the Rome Olympics. After the Games ended and I returned to Israel, it was time for me to join the Army. Since I had graduated from Wingate College and was a physical education teacher, I was assigned to a special location at the Tel Hashomer hospital complex at the rank of First Sargent. At Tel Hashomer, my assignment was to help rehabilitate injured soldiers through the use of fitness exercises and physical therapy. I had all the physical equipment necessary to work with them and these wounded soldiers improved greatly. 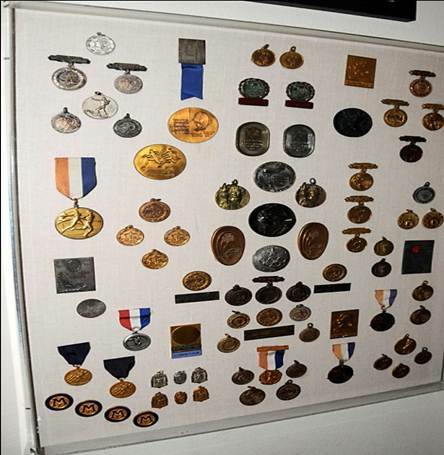 Since I was an Olympian and a bit of a celebrity, I was also assigned the job of fitness training for the top paratroopers, Special Forces frogmen, as well as the elite officers in the Army. Every morning from 7 am to 8:30, there would be the somewhat frightening sight of the entire parking lot full of soldiers with weapons standing at attention. These soldiers were amassed as a security detail to protect the Generals that I was training for their own fitness. About twenty five men attended my fitness class. I paid little or no attention to their names but only whether they worked hard and followed my instructions. I was aware that one of them was Moshe Dayan, who was then Chief of Staff. Another officer, now a well-known and recognizable individual, was Ariel Sharon. He only trained 3 times a week. These men would have to stretch, run obstacle courses I designed, and then train with resistance exercises. We also played indoor soccer, volleyball, and tennis. There were no easy workouts for these men despite their elevated ranks. It was more important that they be fit and healthy rather than spoiled and out of shape. Many of these military leaders, Sharon, Dayan and others were heroes to me and nearly everyone in Israel for what they had done to save our country in so many wars. Therefore, I felt especially honored and appreciative when they took the time to compliment me on my tenacity and my success at the Games. It made me feel that I truly was on the right path. I continued to conduct this class for about 2 more years. It was a pleasant surprise for me to encounter one of these General in 1990 who was training according to the plan I had proposed for him 30 years previously. He explained that since I had been so insistent when he participated in my fitness classes, he was afraid of my wrath should he be less diligent now. I was unsure whether he was serious or joking, but since he was working out, I assume at least my message had resonated. 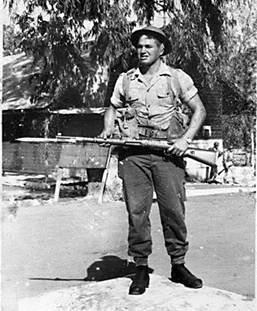 While I trained the injured soldiers at Tel Hashomer and the officers as my Army duties, I continued to practice throwing the discus and shot. The Army allowed me to continue competitions throughout Israel and in neighboring countries. I had competed in Greece and Turkey and won competitions. Now I was preparing for the 1964 Olympics in Tokyo, Japan. Army life had little that appealed to me and it was certainly not a career option. I was, and am, a dreamer, an entrepreneur, and an inventor. There is no place in the army that could synchronize my skills and temperament with the tasks of a soldier. Other than my job of training the officers and helping the wounded, I had no other jobs. I could spend time on my own athletic training, but most of my days were boring, tedious, and uninspiring. One day, however, my boredom was alleviated by the appearance of a beautiful blonde girl who had come to see a friend, “Aluf Geva”. In Hebrew, “Aluf” has two meanings. One meaning is “Champion” and the other is “General”. I said, “Aluf Geva is not here but Aluf Ariel is.” This beautiful girl had a very puzzled expression on her face when she asked, ”Who is Aluf Ariel?” I pointed at myself and replied that “There are many “Alufs” who are generals but there is only one “Aluf” who is a Champion. I am that “Aluf”. She laughed and, fortunately for me, was not offended by what some would consider arrogance. Her name was Ilana and soon this beautiful blonde girl, who was a nurse and an officer, became my good friend. She was, and still is, one of my best friends. We went to the movies together, talked hours in to the evening, and I greatly admired her mind, talents, and friendship. She would bring me vitamins from her hospital since I was as health conscious then as I am now. We enjoyed the beaches, my friends, and the nightlife of Tel Aviv. This wonderful friendship lifted some of the dullness and boredom of being in the army. I did not want to have an affair with her since she seemed too “good” for me. I think I was affected, to some extent, by my family experiences. This is the only explanation I have for my preference for women who seemed more dangerous. Of course, life immediately sent one my way. After one competition in the northern part of Tel Aviv, a few of my fellow athletes were walking back to our homes. On the way, Ayala Hetzroni, a female Olympic shot putter, was walking with another woman. This woman was extraordinarily beautiful, quite tall, about 5’10, with long blonde hair. “Who is that?” I asked Ayala. “That’s Yael. She’s a dancer with the Inbal group.” The Inbal troupe was a renowned dance group in Israel. I tried talking to Yael, probably boasting about this exploit or that, but with little success. She did not seem to be particularly interested in me or my conversational offerings. She was probably used to men being interested in her wherever she went. There was another factor that I had to consider. Although I was not close to my father, I knew one thing. He looked down on Sephardic Jews which most of the Middle Eastern Jews typically were. 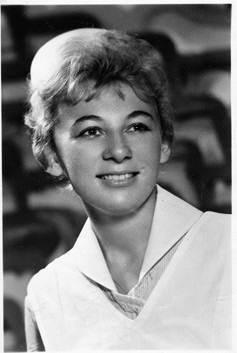 My father was already met my friend Ilana, a respectable beautiful Ashkenazy nurse who had been born in Poland. He could not say enough good things about her. Indeed, Ilana remained in close contact with my father long after I had long gone to America. I knew that my father would not have the same positive reaction to Yael and would harbor more than mere resistance to her Middle Eastern heritage. Yael continued to seem bored with me and, apparently, we had few common interests. Hollywood movies have generated millions of dollars with stories of attractions based on looks and feelings. Sometimes these obsessions on beauty or behavior become the only things that matter. Perhaps some of Yael’s allure was my father would not like her, but mostly it was her beauty and the pride I felt when other men turned to look at my girl. Unfortunately, youth rarely recognizes the costs that poor decisions will eventually garner. In those days, there were few personal telephones. In Israel, if you wanted to contact someone, you had to travel to the person’s house. Yael had told me where she lived so I walked half way across the city of Tel Aviv to ask her for a date. To my amazement, she said “Yes”. Our first date was to see the movie “Psycho”. I did not try to touch her or hold her hand. I kept a respectable distance because fundamentally I was shy. But every time Hitchcock managed to provoke a surprise or shock which terrorized the audience, she grabbed my hand or arm! After the movie, we walked back to her home. Just as she turned the key in her door lock, I said, “Watch out! Tony Perkins is behind your door.” She whirled around and slapped me across the face. Unfortunately, I did not recognize this response as a less than auspicious beginning. At that time, Yael was only 19 and I was 21. We were relatively unsophisticated in our dating practices. Still, I began dating her and soon we were boy- and girlfriend. I must admit I liked how all heads turned when we walked into a room. Here I was with this woman whom others could only stare at in admiration. I was not particularly drawn to her personality and she had no interest in academic pursuits for me or herself. She was very artistically talented in dancing, painting, and crafting jewelry. While I knew that she had family problems, but this was of little interest to me particularly since I had a background of personal difficulties. She was beautiful and that was sufficient to mesmerize me. Now my life was filled with complications and enjoyment. I was busy with my Army job, my daily exercise routines, the discus and shot put training activities, and with two interesting women. One of them was beautiful and difficult, Yael, while the other one was beautiful and a lovely caring friend, Ilana. 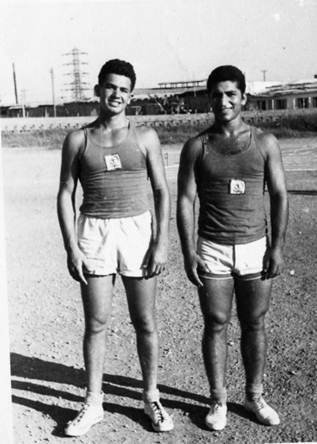 While I was enjoying this feminine duality of the heart, Yariv Oren, at one of our training sessions, mentioned to me that they had received a letter from the US Minister of the Interior that Israel was qualified to send two athletes to the USA for training. The US department would pay all of the expenses. He told me that I was one of the candidates they were considering. In Israel, there were two athletic clubs, the Macabi and the Hapoel. There would be one athlete chosen from each club to be sent to the United States for this training. The Macabi had already selected an athlete by the name of Amos Grodinovski. Amos was a friend of mine, a sprinter and long jumper, who had also represented Israel in the Rome Olympics. 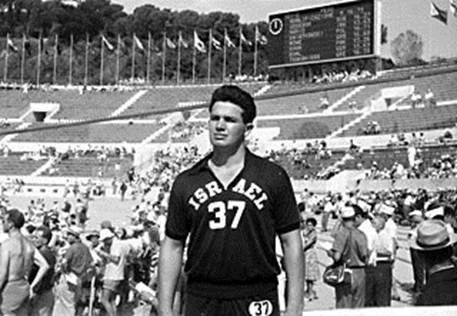 The other leading candidate was Meir Yakobi, a Hammer thrower, who had just broken the Israeli record in the Hammer. Unfortunately for me, Meir and Amos were the ones who were selected for the 3-month Exchange Program. I was devastated since I had lost an opportunity to go to the States. But, my coach, Yariv Oren, was unhappy with the selection and, using his political connections, replaced Meir with me. I was ecstatic. Although Meir was my good friend, these decisions were not ours to make or challenge. Therefore, I joined Amos for the trip to the USA in March of 1963. “Well, I guess an injustice was done to you and I have never forgotten it,” I told him. “Well, Yariv, what do you have to say?” Gilad asked. Yariv’s answer was “No comment. “ We all laughed and enjoyed another cup of strong, sweet Turkish coffee. 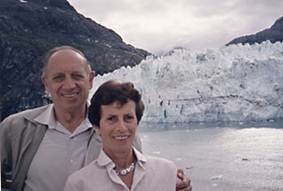 On March 8, 1963, I was now ready to leave for the Exchange Program in the United States. I needed to receive an early discharge from the Military before I would be allowed to fly to the United States. Luckily, again, Yariv was there to help me. He persuaded the Military to discharge me two months earlier than my actual completion date so that I could represent Israel in this Exchange Program. 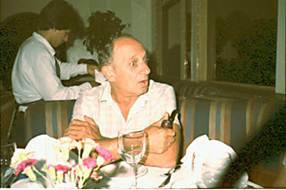 What a dear friend he was and how fortunate I was that Yariv was there to help me in so many ways and for so many years. When we arrived in NYC, people from the US department of the Interior came to meet all the athletes from at least 30 countries round the world. When they called my name out, it was Mr. Yacobi, since they still had Meir’s name, rather than mine. I corrected them and explained it was a last minute change. They put each of us in a luxury hotel and we attended lectures on how to behave. Soon each of us was informed of the name and location of the university we would attend somewhere in the USA. Before we flew to our assigned universities, the athletes presenting all of these countries made an appearance on the Ed Sullivan Show! I must report we did not get the same ratings as when the Beatles appeared. New York had seemed like another planet despite my having traveled to Rome as well as other large cities outside of Israel. But there was nowhere like New York City. This huge, bustling city with its tall buildings and endless concrete seemed like a science fiction movie. Yet, the energy on the streets was contagious and it gave life to my fantasies of America being a place where anything was possible. Amos was assigned to the University of Louisiana and I was assigned to Colorado State University in Fort Collins, Colorado. After I arrived in Colorado, I was housed in a dorm with regular college students. I began training every day in the afternoon with the Track and Field athletes who represented Colorado State University in their athletic conference. I asked if I could attend regular college academic classes during the times when we were not training. The school officials readily agreed so I joined the Physiology and Anatomy class in the Pre Medical program. It was an amazing experience although I had some difficulty with the English and I lacked some of the background material for the topics being discussed. However, I was confident that I would do well as a student in an American university if only I were to have the chance to try. The Coach at the Colorado State University was Mr. McCone, a dedicated coach who helped me with my technique. During one of the practices, I asked Mr. McCone if he knew John Walker from Wyoming. Since both Colorado State University and the University of Wyoming were in the Western Athletic Conference, the two coaches were well known to each other. I asked Mr. McCone if he would call Coach Walker to tell him that the Israeli athlete whom he had met at the Rome Olympics was now in Fort Collins. I was surprised, when two days later; Mr. Walker appeared at the training stadium. We became reacquainted and chatted about what I had been doing during the three years since he had seen me in Rome. During this meeting, it became clear that my recent throwing results were better than the current Wyoming record in the discus. “Fantastic!” he said, and patting me on the shoulder. I will send you a ticket in the mail in Israel if you just give me your home address. I will take care of all of the University details so everything will be in order when you arrive in September. I was in shock for the remainder of the training session in Fort Collins. I could not believe this fantastic opportunity to study in the United States was practically a reality. As soon as I returned to Israel, I went to see Yariv. By then, Yariv had been appointed to be the Minister of Sports. I was extremely nervous. This man had done so much for me but I knew he was a strong Zionist. In Yariv’s mind, all of the young men whom he had trained and supported were to be the future of Israel. In addition, we had been very close friends for quite some time and I also knew that I held a special place in his heart. I knew that he would not want me to leave. Yariv was in his office with its windows looking out over Allenby Street. The Mediterranean sun was shining in and we could see the ocean in the distance as it flickered in the sunlight. Yariv listened to my words warily and then stood up, shook my hand, and gave me a great bear hug. This wonderful man hugged me, as my father had never done. Although he was only 8 years older than I was, he had been the one who was behind every success that I had achieved to that date. I owed everything to him and his encouragement. Now I had to tell Yael. She met me, dressed up and smiling. She became upset but I continued to explain how important it was for me. “We have enough professors in Israel,” I laughed. “I will come back,” I said. I don’t think I ever really intended to return to Israel. I had many good friends in this special country and everyone knew my name because of my sports activities. But it was still the country where my mother lived in an institution. It was still the home where my father read in the papers about his son performing in the Olympics and breaking records for Israel. Yet my father could not tell me that he sneaked to the stadiums to watch my performances, that he had saved every newspaper article in a scrapbook, or that he was proud of me and my successes. I did not discover my father’s devotion to my activities until many years later. What I didn’t tell anybody was I was not sure that I could get a visa to the States. I still had a “J” stamp on my passport, which was the temporary visa for my Exchange Program trip to Fort Collins, Colorado. Undaunted, I went to the American Embassy and kept my mouth shut. The athletic gods were with me. The Embassy ignored my passport and issued the student visa. I was on my way again. I dreamed of a new life, a bigger life, an unforeseen life. I had not bothered to look at a map to see where Wyoming was in America, I could barely speak English, but the Highest University in America was definitely going to be the start of what was to be a life of many peaks and, naturally, many valleys. Generated on 4/25/2019 11:27:05 AM (PST) ADI/HQ/GBA/2019/ARIELCLOUD/v3.0.2018.0126.